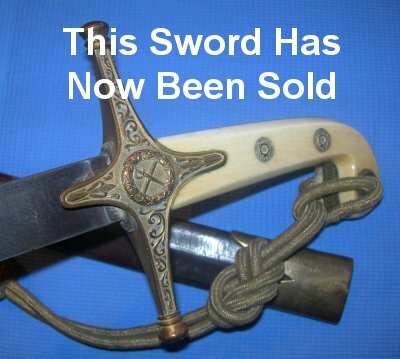 A scarce, authentic 1831P Victorian British general's mameluke sword with genuine ivory grip. These swords are incredibly hard to source. Plenty of Indian made reproductions abound, but not genuine ivory gripped Victorian general officer's mamelukes like this one, made by Moore & Co of London. OK, the etching on the blade is very feint to say the least, and the ivory on one side of the grip near the knot hole is cracked, as you have to expect with real ivory, and the scabbard may well be a later replacement, but the sword is 100% authentic and in sound condition. The 30 inch blade is form in the hilt, the ivory grip generally good. My reference number is 738 (298). Full sized / further images available upon request.